INSPIRATION LAKEVIEW: Click for the City's new Waterfront website. The City asked all citizens to come together to develop the Visionary Concept Plan for the Lakeview area waterfront through the inspirational workshops (including 3-D modeling) held on December 2-4, 2010. Residents shared ideas about the kind of waterfront they envision for the entire City per the themes of 'Blue', 'Green', 'Urban' and 'Culture'. The draft Plan will be presented at Planning and Development Committee (all of Council) on Mon. April 18. ► Click for MIRANET article which includes PHOTO ALBUM of the former power plant demolition, tour of the OPG lands and the recent workshops. NOTE: Visioning for the Port Credit sections of the waterfront -- the federal Marina lands and former refinery (brownfield) lands now owned by Imperial Oil -- will come next (starting 2011). The City has 22km of waterfront in total. ► Click for PHOTO ALBUM (107p PDF) of the tour of the G.E. 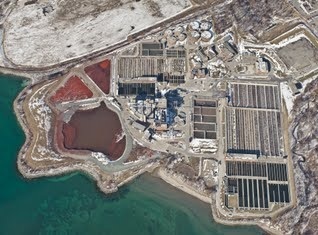 Booth Wastewater Treatment Facility in Lakeview on October 1, 2011. Click aerial photo (or here) for zoom.